Hello Katie Girl: It's a Wrap! I think this will "wrap it up" so to speak for summery outfits posted on my blog until next spring. These photos were taken during the last weekend in October while it was quite hot with temperatures surpassing 90 degrees. Looking back on October, it certainly seemed more like an extension of summer with weather that was, in many ways, even more extreme than what we experienced during July and August. Luckily, this week has taken a turn for a decidedly more fall-like feel with cloudy skies, rain and much cooler temperatures. So with this post I think I am going to officially bid adieu to summer and say hello to fall...although this is contingent upon the weather staying cool, so who knows? This wrap skirt was a purchase I made only a couple weeks ago. I was very lucky that the skirt came back in stock in my size. I love the idea of a wrap skirt just as long as the slit isn't too high or too revealing. 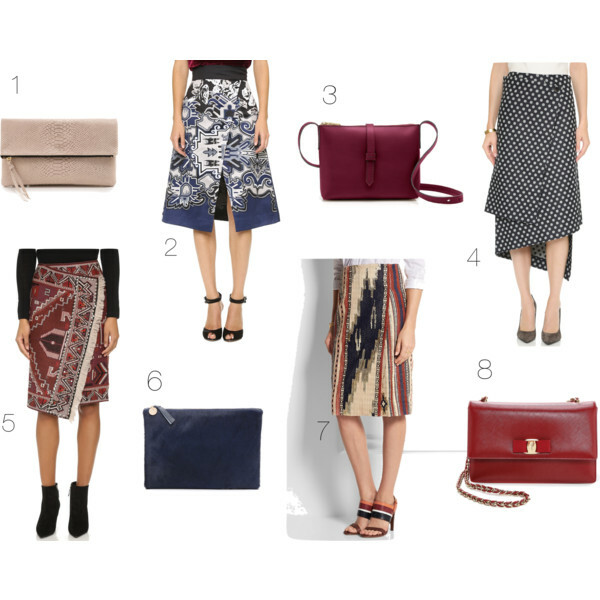 Below are some other picks for wrap skirts along with bags that would match just perfectly. Just like the skirt I am wearing today, these skirts and accessories could easily be worn for summer, but could also transition nicely into the cooler fall months with the addition of some layers. Great wrap skirt! I love all the colors in it! 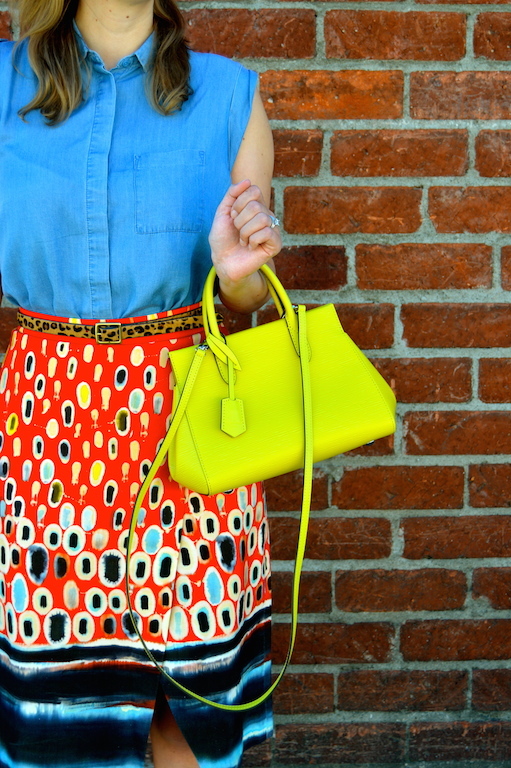 In love with that stunning and bright wrap skirt. I also love all the options you chose, especially all the skirts. Those wine/burgundy clutches are beautiful, too. 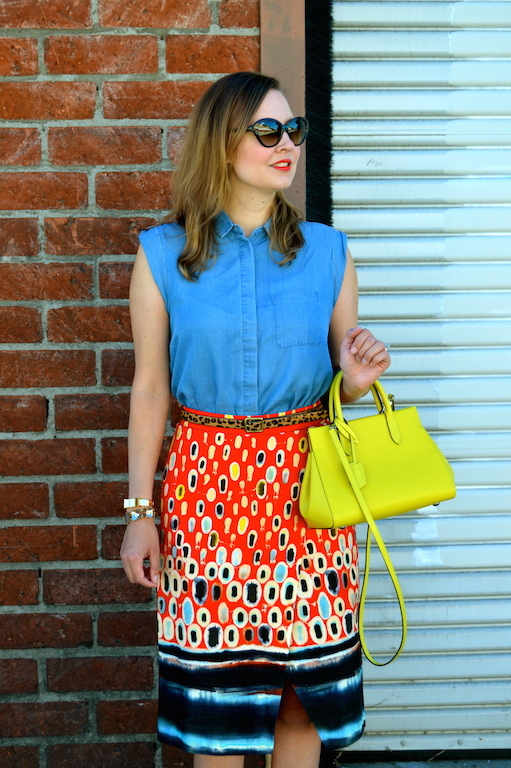 That wrap skirt is so vibrant and I love it with the skinny leopard belt! 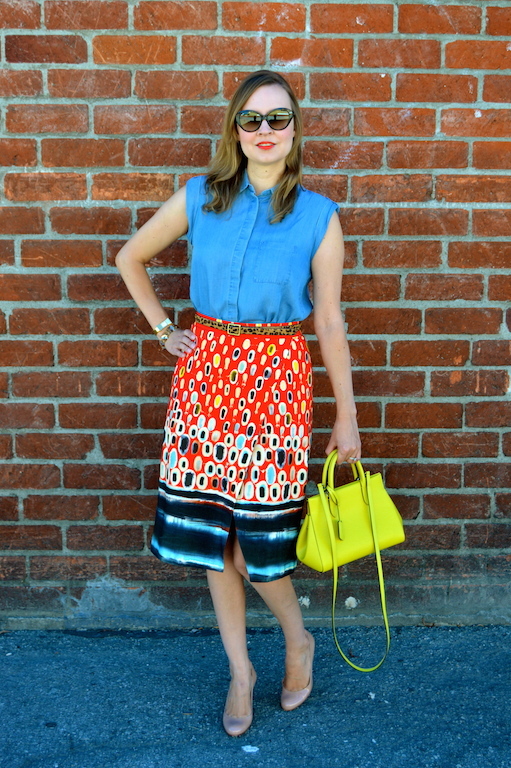 Your printed wrap skirt is so lovely, really nice with the chambray tank! and i am already looking forward to warm weather and spring! LOL! Finally we're getting some fall weather in California! Yay! It's like we went straight from summer to holiday this year, right? Hooray for the cooler temps! I love the print and color of this pretty wrap skirt. I always have a hard time with J Crew's wrap skirts opening too much for me so I tend to stick to their pencil skirts.